Markets will always have bubbles thanks to human nature, Yale economist Robert Shiller says, and financial advisors can help cut through the buzz. The S&P 500 is up about 0.75% year to date, while the Dow Jones Industrial Average is down about 1.23% as of mid-Friday. After the magnificent returns of 2013, investors and market experts are naturally asking if the market has topped and a correction is beginning. 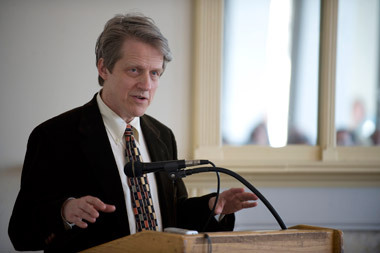 Looking at the broader roots of bubbles and busts, Yale economist Robert Shiller says there’s much experts can explain and much they can’t. Nonetheless, in an interview posted Friday by the Wall Street Journal, the Nobel Prize winner tells investors they need to work with professionals rather than do it themselves, given the irrational, unpredictable and volatile nature of stock and real estate markets. The alternative, attempting to “fix them” is no easy task, though it may be worth a shot. The stories, he adds, are what resonate with us — not rational information like statistics or theory. This situation, he says, means investors can benefit greatly from financial advisors. While Shiller thinks some people can invest in winning stocks, he says it is no walk in the park. “The question is often whether it’s possible for anyone to pick stocks, and I think it is. It’s a competitive game. It’s like some people can play in a chess tournament really well, but I’m not recommending you go into a chess tournament if you are not trained in that, or you will lose,” he explained. There’s a difference between the financial markets, and real estate, he adds. “But if you are thinking about buying real estate and renting it out, fixing it up and selling it, that’s the kind of market that’s less populated by experts. And for someone who knows the town, that’s doing business, I’m not going to tell someone not to do that,” the economist said. As for whether or not he’s good at picking investments, the economist says he has what it takes: a focus on value, not hype. In other words, the exact advice advisors give to clients each and every day.